Bracketed by two electrical power substations, the entrance to this Albany park would be easy to miss if not for the big sign on Queen Avenue S.W. Hazelwood Park looks like a forgotten part of the Albany park system, which totals about 600 acres at 32 sites. The system has 20 neighborhood parks, and Hazelwood, at 1999 Queen Ave. S.W., is one of those. At 3 acres, it is not the smallest. But it’s kind of out of the way. One of my bike routes takes me past the entrance, and this week I turned into the gravel driveway instead of riding past as usual. 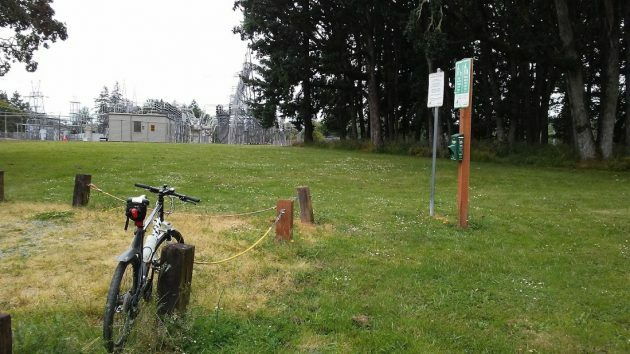 The driveway leads into the park between a Pacific Power substation on the right and a sprawling installation of the Bonneville Power Administration on the left. Inside the park, there’s not much there, though a listing on the city’s website says the place has picnic tables. Years ago, when we still had day jobs, my wife and I once sat at one of them for an impromptu picnic after work. Until Wednesday, I hadn’t been there since. Visitors to Hazelwood Park, rare as they may be, can’t help but notice the grove of towering oaks that dominates the site. That kind of “oak island,” home to all kinds of wildlife, is getting to be rare in the Willamette Valley. 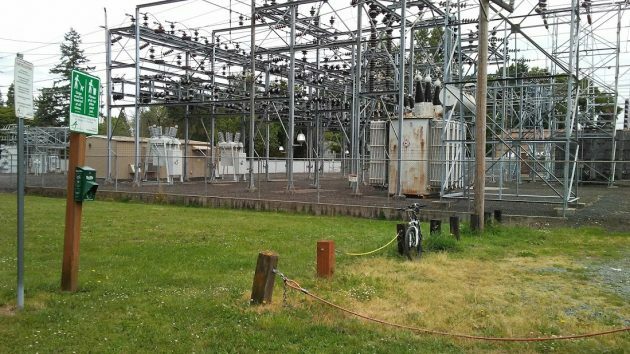 Pacific Power’s Hazelwood substation on one side of the park. And the BPA installation on the other. Perhaps the Post Office could be convinced to move the Albany operation to this locale. I live in the area and have frequented the park for many years. In fact I used the park to study bryophytes (moss) that had fallen off the old oaks towards my degree in horticulture from OSU. (The oaks) should certainly be persevered. But the park is not so much a park but a forgotten area. There where picnic benches just last year and the grass within the trees was kept in check. I’m just wondering if this park is like other ones in the area (like Bowers Rock state park) that are just being forgotten about. It has potential. There’s still a lot of unknowns and suspicions about the possible danger of the fields around high-power devices. Perhaps that’s why the land wouldn’t sell. At best, this equipment usually generates electrical radio frequency noise and hum that makes being around it unpleasant. I think the City is going to be saddled with this property for a lot longer. Given that your bicycle bears witness in many of your photographs, perhaps you ought to consider monetizing the two-wheeler. Signage, not unlike that once found adorning the Lance Armstrong bicycle in the innocent days of touring. There’s money to be made. I have visited this park over 25 years from my nearby home with two generations of dogs, who consider it their park. It is the home of many species of wildlife, including the bald faced hornet, which stung me on the hairless crown of my head one afternoon, having ventured into its territory after a Frisbee. This park has long had only three kinds of visitors: Dog walkers, drug users and homeless can wranglers. The tables and other amenities were removed to prevent local high school kids from leaving trash strewn around after yet another beer party. It has also functioned as a wayside for travellers, sometimes unable to afford better lodgings. Most users I encounter these days are sitting in their cars eating lunch, looking at their phones. The high school kids still come, but with no tables, stay in their cars until the weather improves. My dogs entertained many people, fetching various balls and frisbees and jumping back into the tailgate of my old Chevy pickup when other users approached. Sharing was important. Now, they use a ramp to ease arthritic joints. I agree that the oaks should stay. I also agree that few buyers will avail themselves of the opportunity to purchase this property, given the proximity of electrical sites. The research needed to prove this place is safe, long-term, is not available. I doubt it will be made available anytime soon. I never knew there was a park there. They should plant some trees to block that unsightly building in the background. Fix it up. 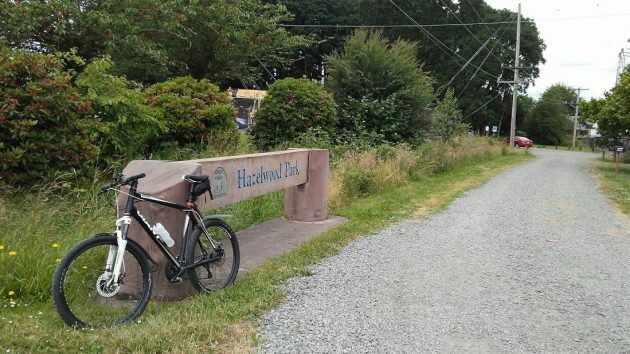 I am generally in favor of keeping parks, especially in this neighborhood. I don’t believe there are that many parks in that area.